About the Book: In early July 1864, a quickly patched together force of outnumbered Union soldiers under the command of Maj. Gen. Lew Wallace prepared for a last-ditch defense along the banks of the Monocacy River. Behind them, barely fifty miles away, lay the capital of the United States, open to attack. 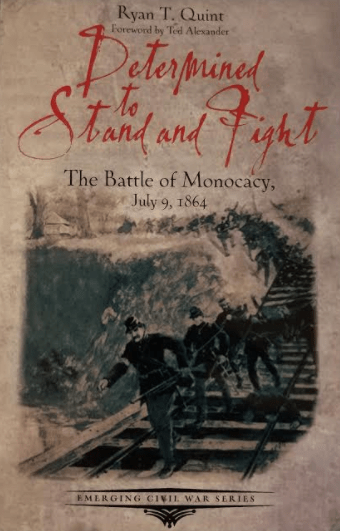 Determined to Stay and Fight by Ryan T. Quint tells the story of that pivotal day and an even more pivotal campaign that went right to the gates of Washington, D.C. Readers can enjoy the narrative and then easily follow along on a nine-stop driving tour around the battlefield and into the streets of historic Frederick. Another fascinating title from the award-winning Emerging Civil War Series.